As Christians, we live in the environment of forgiveness and grace. As we forgive others, the basis of that forgiveness is the incredible debt that God has already forgiven us (Matthew 18). But at the same time, as God sees that his forgiveness is kept in circulation and passed on to others by us, he joyously pours out more forgiveness on us. As hard as it is to forgive someone when we have been genuinely harmed, Jesus wants us to know that the blessings of doing so far outweigh the costs! Loving and just God, thank you for cleansing and forgiving me by the atoning sacrifice of your Son Jesus. 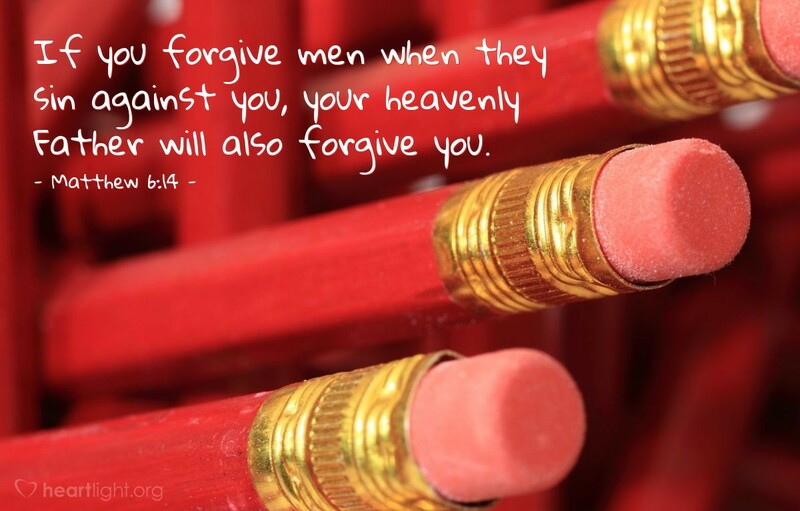 Thank you for challenging me to forgive others as you have forgiven me. Thank you for demanding that your people be a community of forgiveness. Forgive us, and especially forgive me, when we are reluctant, slow, or suspicious about forgiveness. I ask especially that you will forgive ___ for ____, and I ask you to bless this person with your love and grace. In Jesus' name. Amen.